Saints set a target of three wins after their Dublin drubbing in December, and on Saturday they completed the job. It wasn't easy, because Bristol posed a real threat. Their breaks were brisk and they scored one of the tries of the season through flying full-back Jason Woodward. The Kiwi was one of the stars of his team's show at Franklin's Gardens, but Saints just had too much. The power of their pack, particularly the indefatigable back row forwards, told in the end. Captain marvel Tom Wood, reigning player of the year Teimana Harrison, fantastic Frenchman Louis Picamoles and super sub Jamie Gibson dragged the team over the line. 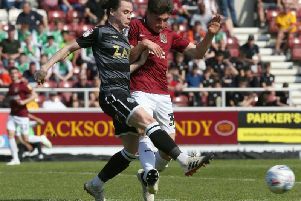 Their work rate was hugely impressive and with Calum Clark, Ben Nutley and Sam Dickinson not even in the matchday squad, Saints' depth in that department is impressive. There is still plenty of work to be done in other areas, but as Wood said - confidence is finally building. Saints have got the winning habit back and, despite the fact they are out of the reckoning in the Champions Cup, they will want to maintain their hot streak next weekend. Some players undoubtedly need a rest, with men such as Mike Haywood and Courtney Lawes constantly putting in huge 80-minute shifts. But with Castres also struggling in Pool 4, they are likely to make changes of their own, giving Saints another big opportunity to send the paying public home happy. Their appetite was certainly sated on Saturday, having not only seen a victory, but also an entertaining encounter. They have been few and far between at the Gardens during recent times, but with Bristol coming to play rather than squeeze the life out of Saints, there was plenty of excitement. And, most importantly, there was end product. Defensively, Saints were a bit too open at times, which was surprising given how few tries they have conceded in the league this season. But perhaps it was a sign of a new-found focus on attack and a struggle to get the balance right. Whatever it was, it made for a good watch. And fans finally headed home feeling they had been fully entertained, with their side managing to provide the right outcome, too. Stiffer tests will come in the months ahead, but Saints have at least given themselves a chance of making the top four. The game at Bath next month will be huge, with just five points now separating Todd Blackadder's fourth-placed team from fifth-placed Saints. Leicester will be in the mix, too, with Saints having just edged a satisfying point ahead of their rivals thanks to Saturday's win. Tigers play at Wasps today and could return to fifth. But whether they do or they don't, Saints have done the job they set out to do. Now they need to continue 2017 as they have started it: in winning style.